After a dry spell pushing up temperatures from a balmy 32 degree Celsius to 39 degrees in the last one week, weathermen have warned of heavy rain in the northeastern region in the next four days. The India Meteorological Department (IMD) on Tuesday issued a rain alert in the northeastern states till Saturday. Even as Kerala struggles to return to normal after a devastating flood killing more than 300 people since May, the rain alert has put Assam on its toes. 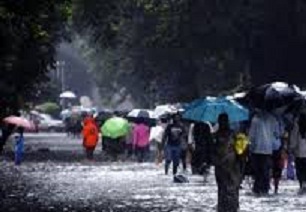 A report published in the The Times of India stated that the Regional Meteorological Centre (RMC) of IMD warned there would be “heavy rain” over Assam, Meghalaya and Nagaland on August 23 and 24 next. The report further stated that data available with RMC indicate that light to moderate rain occurred at most places over Arunachal Pradesh, Meghalaya, Mizoram and Tripura in the last 24 hours with isolated heavy rain over Arunachal Pradesh. Light rain also occurred at a few places over Manipur. North East since August 15. This resulted in less cloud formation over the region and that is why the temperature soared. But, of late, the situation has become favourable for heavy rain,” said Shaw. Usually, temperatures in Guwahati in August are around 32 degree Celsius but in the last few days it shot up to 35-39 degrees. While the mercury level almost touched 40 degree Celsius in the North East, on Tuesday it dipped to 36 degree Celsius in Tezpur and Silchar. Weather forecast issued by RMC on Tuesday predicted moderate rain accompanied by thunder showers likely at many places over Arunachal, Assam, Meghalaya, Nagaland, Manipur, Mizoram and Tripura.